After the turnout at last week’s student walkouts, in which tens of thousands of students participated from more than 3,000 schools, organizers for this Saturday’s “March for Our Lives” are expecting more than half a million protesters to take to the streets in Washington, D.C., to demonstrate against gun violence. Led by students from Stoneman Douglas, Saturday’s march will begin at noon and proceed down Pennsylvania Avenue, ending with a rally featuring student speakers and music near the Capitol building. More than 800 sibling marches are planned in cities and towns across the country and around the world. 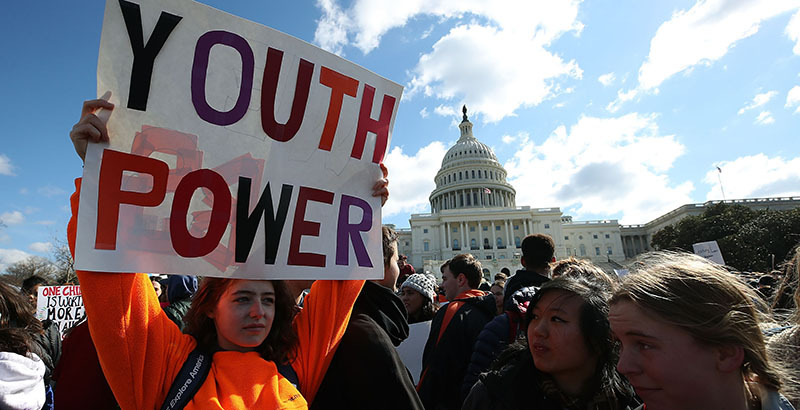 The marches are part of a movement that sprang up in the hours after the February 14 shooting in Parkland, when student survivors started speaking out on social media and soon appeared on national news programs urging people to take action to prevent gun violence. Since then, they have inspired students around the country to become activists and organizers using the motto — and hashtag — “Never Again.” On March 14, hundreds of thousands of students walked out of school in demonstrations that observers say are the largest since the Vietnam War. During a forum at the Harvard Kennedy School of Government Tuesday, some of the student leaders said they are inspired by the legacy of the civil rights movement and its leaders, especially Rep. John Lewis of Georgia, whom some recently met on a trip to Washington, D.C. Lewis has expressed support for their movement. The march has garnered high-profile support, with celebrities including Demi Lovato, Miley Cyrus, and Common slated to perform at the D.C. rally. The March for Our Lives organization has also received financial support from a number of celebrities, including Broadway stars Lin-Manuel Miranda and Ben Platt, who are donating proceeds from a new song, “Found/Tonight,” to the cause. D.C. Mayor Muriel Bowser, a Democrat, expressed her support for the march in a video with Justin Timberlake, and she said the city is putting extra safety and security precautions in place for the event. Additionally, the march has received financial support from the nonprofit group Everytown for Gun Safety. Marches are planned in every state and in several countries around the world. In Wisconsin, students have planned an extension event called 50 Miles More in which a group of students will march 50 miles from the state capital, Madison, to Janesville, Wisconsin, Rep. Paul Ryan’s hometown, over three days starting Sunday. The reason for the march is to sustain national attention and inspire longer student marches in other states, said Katie Eder, a high school senior and one of the organizers. “We’re directing it at Paul Ryan to say, ‘You can’t ignore us anymore, and we want our message to be heard.’ But we’re really sending that same message to the entire country, to say we’re not going anywhere, and we’re going to continue to take action until change is made,” Eder said. Another school walkout is planned for April 20, the 19th anniversary of the Columbine High School shooting. Lane Murdock, a 15-year-old student from Ridgefield, Connecticut, started that event because she wanted to create a way for students to be heard. Yesterday was empowering. The love, strength and solidarity shown was historic. Now, let's turn to the march and protests we have ahead. Onward and upward.